An iPad Pro is pretty hard to lose in the cracks of a couch, the bottom of a backpack, or in a desk drawer. The Apple Pencil, various cables, adapters and other bits required to make full use of the tablet? Despite their glossy white finish, Apple accessories have always been notoriously easy to lose track of. Happily, WaterField Designs has a pair of solutions to the problem: the Atelier iPad Gear Case (69) and the Atelier iPad Pencil Case ($29). At 7.5 inches by 1.25 inches by three inches, the Atelier iPad Gear Case is just long enough to store an Apple Pencil and wide enough to accommodate the Pro’s power adapter, lightning cables, extra tips for your Apple Pencil and any other wee bits and pieces you might want to stash in it. During testing, I routinely carried two lighting cables, a 12W USB power adapter, my Apple Pencil, and a Mophie PowerStation XL battery ($73 on Amazon): all items that would normally flop around freely in my backpack. I found that the Gear Case kept them well organized and easy to access. There’s no getting past how well made the Atelier is. Smooth, supple full-grain leather and neat stitching make a striking first impression. What’s more, the case’s leather exterior holds up to abuse. Having used the loaner sent to me for over two months, I can tell you that despite the almost constant casual thrashing that the Atelier has taken being tossed around in my backpack, on cross-country flights or work trips to the local pub, save a few small scuffs, it still looks practically new. While in transit, two steel snaps keep the case’s flap closed up tight and its contents from spilling out. Open the Atelier up and you’ll find the case is lined with red Ultrasuede—a soft, abrasion-free material that’ll keep the glossy finish on your Apple Pencil and, I suppose your iPad Pro’s power adapter, looking as smart as they did when you first got your hands on them. Most of the Atelier’s interior space is an open maw, ready to accept whatever accessories you can jam into it. 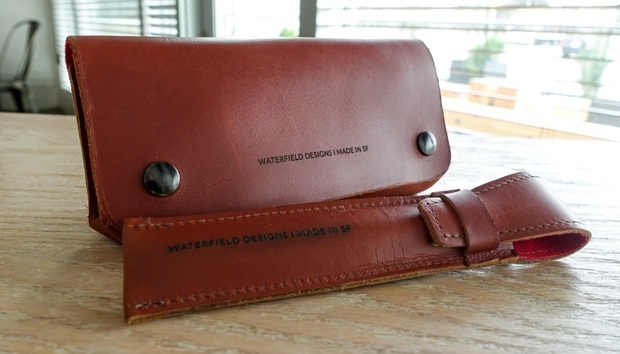 However, to keep things neat, WaterField Designs saw fit to sew in two small pockets into the case’s interior that are sized for a Lightning or Apple Watch cable. In the flap, you’ll find a single pocket that’s designed to snugly fit an Apple Pencil. The Atelier is a well-designed accessories case made from premium materials that will likely last for years. But here’s the sticking point: It’ll set you back $69. That’s a lot of money for a glorified pencil-type case. While it might not do it with the same amount of style, a three buck pencil case from your local Walmart or even a zippered compartment in your backpack can fulfill the same role as the Atelier can. And for most folks, that’s good enough. However, if you need to haul your iPad Pro and accessories into an urbane environment, say a boardroom for a meeting, or are comfortable spending money on what is undeniably a luxury item, fill your boots. Try as you might, you won’t find a better made—or better looking—case for your iPad Pro accessories. The Atelier iPad Pencil Case is made from the same materials as the Atelier iPad Gear Case is, but sized solely for storing an Apple Pencil. Like the iPad Gear Case, the Pencil Case looks and feels great. And, so that you can always have your Apple Pencil close at hand, it comes with a built-in belt clip, although it works well for fastening the case to your backpack, too. However, I find it hard to recommend, to anyone. At $30, the Pencil Case costs $39 less than the Gear Case but holds perhaps 70 percent less stuff. It’s designed to be clipped on a belt or slipped into a hip pocket. But when worn on a belt, it looks a bit goofy. When stashed in a pocket, the Pencil Case is thick enough that it’ll ruin the lines of your pants, especially if you’re wearing snug-fitting jeans. Speaking of snug, while I loved how secure the Apple Pencil was in the slot provided by the Gear Case, the Pencil Case was all together too tight. I had to really pull on my Apple Pencil, on several occasions to remove it—an issue that has not been resolved with the passage of time or frequent uses. Some people might like this snug fit as it keeps your pricey Apple Pencil in the case and out of harm’s way. But I’m not a fan. WaterField Designs’ Atelier Gear Case and Pencil Case are beautiful, bespoke products, that fulfill roles that less expensive, or even free alternatives could sort out nicely. But if you’ve got money to burn and feel the need to add a dash of class to your everyday carry, could be worth your attention.